With constructive discourse and knowledge, through the dissemination of different viewpoints and tactics, those who view the content here can not only see, but combat, the frequent violations within modern policing today. Therefore, it cannot hate, or love, anything. Yet, CopBlock.org was founded on the principles that all human beings have equal rights; no one class or group of people has any more rights than another just because of their job. The failure and inability to realize and act on this philosophy is to the detriment of all individuals. By focusing the disinfecting light of transparency on public officials, we safeguard not only our rights but those of future generations. 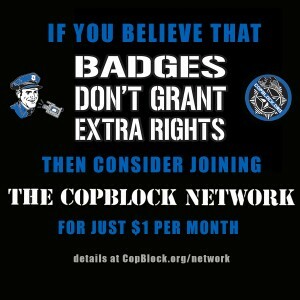 Those of us volunteering at CopBlock.org (by contributing content), or via the CopBlock Network, do not condone the initiation of force. As a general practice intellectual property claims of any sort are not enforced here. In fact you are encourage to use information, logos, graphics, etc posted here to join the cause and contribute to activism in your preferred manner. Let’s create a better reality together!